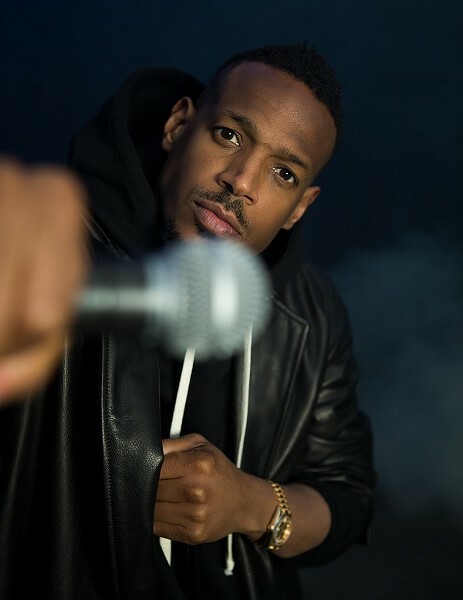 PHOTO COURTESY MICHAEL CARICO Comedian and actor Marlon Wayans will perform standup in Rochester August 30 to September 1. Thursday, August 30, 7:30 p.m.; Friday and Saturday, August 31 and September 1, 7:30 and 10 p.m.
UPDATE: Sadly Marlon Wayans has cancelled his Rochester appearances. You can read a statement from the venue here. The scope and depth of actor and comedian Marlon Wayans' fame is impressive. At 46, Wayans has more than six million Facebook likes and two million Twitter followers, garnered from a three-decade career in film, TV, and now standup. "It's just the beginning," Wayans' told CITY via telephone just minutes before a 7:30 p.m. showtime at Albany's Funny Bone Comedy Club. He's been making appearances like that one for seven years, as part of a process of becoming an internationally touring comic. "In world of standup, I'm still a baby," Wayans says. "I feel like I'm crawling. Standing on my feet. Starting walking. But I may just start running. I'm going to have a quicker progression than most comedians because I've been acting so long. I've been writing so long." Wayans' career started with a bit-roles in the 1987 cult comedy "I'm Gonna Git You Sucka" and on the trailblazing 90's FOX sketch comedy show, "In Living Color." Both projects were created by his oldest brother, comedy legend Keenan Ivory Wayans. "In Living Color" launched the careers of Jim Carrey, Jamie Foxx, Jennifer Lopez, and other Wayans siblings Damon, Shawn, and Kim. Marlon and older brother Shawn also starred in the "Wayans Brothers," a long-running WB sitcom that premiered the night the network began. But Marlon is arguably best known for co-writing and co-producing the mega-hit horror film spoof series "Scary Movie" with his brothers Keenan Ivory and Shawn. The two editions of "Scary Movie" shepherded by the Wayans family grossed $278 million and $141.2 million worldwide. In the years since, he's charted his own path. His first standup special, "Woke-ish," dropped on Netflix in early 2018. He's also currently toplining, producing, and writing an NBC sitcom, "Marlon." Despite all this success, Wayans explained that he has be careful about how his business partners see him. Creatively, both NBC and Netflix "give me the space to do what I do," he says. "I got a lot of trust I think from Netflix and a lot of trust from NBC. Netflix is a little more supportive because of what they put behind the potential of what I'm doing. I think because Netflix is a worldwide platform, they understand that I'm a worldwide international star. And I think sometimes with NBC, they can get it twisted, like I'm an urban talent." But Wayans says he's got a big, worldwide fan base, particularly in Brazil, Italy, and Sweden. He's also performed for audiences in Saudi Arabia. Wayans says he doesn't think that NBC takes full advantage of his international star status. "They're stuck in an old format of 'African Americans don't travel' and that an African American show is an African American show," he says. "Sometimes, I feel like I have to continue to educate the people I'm in business with about who I am as a performer, and the numbers will show." Wayans' performances are part improv and partly based on precisely pruned, often crude premises. He pairs political and physical humor with personal elements. "I'm glad I talked about those things but I need to get that out the way, so I can get to me," Wayans says. "And that's just the shell. We're just now getting to the good part." "The good part" is often darkly funny and awkward. Wayans' sitcom is centered on the realities of his divorce, co-parenting his children, and prolonging his fame in this era. These ideas float into his standup. He uses the both art forms to connect with audiences through shared experiences and emotions. "Sometimes you're an example," he says, "to somebody who is sitting in the audience. Going through the same thing. Or has been through the same thing. And they're looking for when to laugh at pain. As a comedian you bare your soul and you teach people how to laugh -- at themselves. When they don't take life so serious, I did my job." But Wayans doesn't believe that most comedy today is doing its job. He says that most current comics are "subtle" and are "thinking funny"
"I come from a place where we showed you the joke and we were more animated," Wayans says. "I grew up on "Looney Toons." I didn't grow up on CNN." "Marlon" is streaming on Hulu, Netflix, and nbc.com. "Woke-ish" is streaming on Netflix.